When you think of a PEO, what services immediately come to mind? If you’re like most people, you probably think of payroll and benefits administration. And you would be right: these are two of the most common reasons small businesses decide to partner with a PEO. But professional employer organizations do much more than handle payroll responsibilities and make sure you have a good insurance plan. For example, did you know that PEOs can help you with recruiting, training, and even business intelligence? They can. That’s because a PEO is more than a payroll solution. It’s an outsourced human resources solution, which means PEOs help you add value to your HR department and your business with strategic offerings. 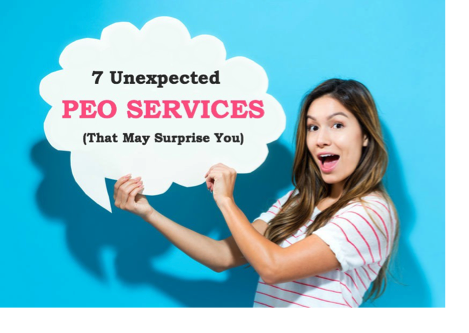 Let’s take a look at 7 services you may not be aware you can receive through a PEO. You probably already know that most PEOs offer a group insurance plan that helps small businesses get better rates on their policies. But did you know that some PEOs also act as insurance brokers or offer brokerage services in lieu of a master group plan? If the PEO offers both and you don’t qualify for their group plan, they will help you find another good option. All businesses should maintain EPLI insurance to protect themselves if an employee brings a lawsuit against the company. EPLI insurance may be included in the PEOs standard offering, but even if it isn’t you can usually pay an extra fee to receive coverage. Learning management offerings vary among PEOs, but most of them offer at least some training services. Depending on the provider, you may be able to take advantage of a full learning management system or a library of content owned by the PEO covering issues like safety, leadership, sexual harassment, conflict resolution, and management skills. Some PEOs will also offer webinars or regional training events your employees can attend. HR technology can save you many hours of work by automating parts of your HR process, giving employees direct access to their personal information, and supplying support tools for tasks like onboarding and performance management. Many PEOs provide a self-service portal for employees, and some also offer an applicant tracking system (ATS), mobile app, performance review software, or other technology tools. Do you have a strategy for your HR department? Do you have a plan to make better business decisions for future growth, employee engagement, and retention? HR is foundational for these decisions, but small business owners may not have the time or resources to develop a long-term strategic plan for HR. Strategy consulting isn’t offered by every PEO, but it’s worth checking the vendors on your short list to see what is available. Even if you’re not ready for it now, it’s helpful to know which providers offer this service if you should need it in the future. Today’s businesses rise and fall on data. Many PEOs offer analytics for core HR needs, and some also offer additional business analytics like compensation analysis, business intelligence, and organizational assessments. If you’re looking for an analytics solution, check with your PEO first. Who has time these days to sort through resumes and screen job candidates, especially if you don’t have a recruiter on your staff? Yet the people you hire can make or break your business. If that's worrisome to you, you'll be glad to know that you can find a variety of recruiting and hiring services through PEOs, including resume sorting, background screening, candidate selection, onboarding. You may also be able to use the PEO’s technology platform to assist with the recruiting process. Not all recruiting services are offered through all PEOs, so check with the ones you’re considering to see what is available. When you partner with a PEO, you receive the benefit not only of the services they provide, but also of their industry expertise. In addition to the things we listed above, PEOs manage tax filing, compliance, workers’ compensation, benefits administration, and other time-consuming, labor-intensive HR tasks. That means the hours you spend researching regulations and completing forms can be invested in the growth of your business instead. And that’s the best reason of all to work with a PEO. Ready to learn more about growing your business with a PEO? Download our free PEO Buyer's Guide! And when you're ready to start your PEO search, check out our one-of-a-kind PEO Matching Tool. It's the fastest, most efficient way to create your customized short list.